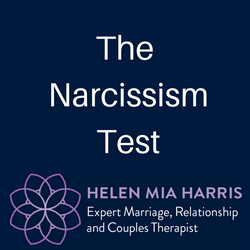 My 5 minute Narcissism Test will tell you if you are and if so, what to do about it. Do you lie to others about your partner’s real behaviour? Do you feel helpless because you’re constantly trying to “understand” your partner’s behaviour? Do you feel as though you can’t do anything right unless he/she approves of your decision? Do you leave with good intentions to begin a life alone, yet return to the relationship as soon as he/she promised it will be different? Is your partner’s behaviour worse if they have been drinking alcohol? When you get in to a dispute, do you feel that your “mind is in a mincer” confused as to how the argument began and how to resolve it? Do you feel interrogated, as if a bright light looms over your every word with “yes” and “no” answers only? Would you like more help from Helen Mia Harris?